Pop-a-Top™ Openers for Bottles and Cans, from 45¢! 3 day production on the classic Pop-A-Top bottle opener keychain which opens both bottles AND cans! It has a 1.5" x .25" area for your laser engraved logo, web address, or other info; up to 2 lines of text with, or without, your logo. Adding a bottom side engraving is only .15 per unit. We tip our glass to better branding! 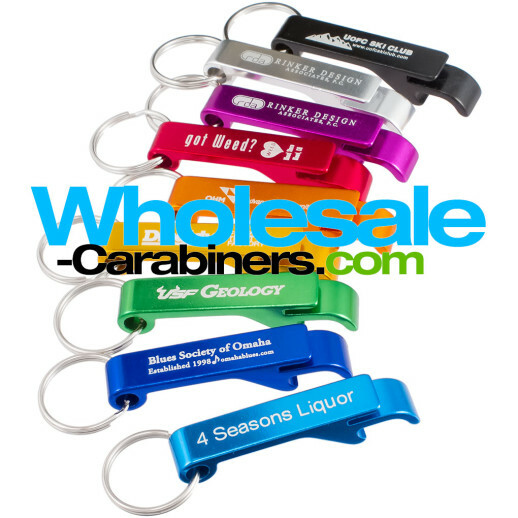 Wholesale-carabiners.com is commited to providing you with exceptional value: better per unit pricing, more colors, lower additional engraving pricing and individually packaging your items in protective polybags at no extra cost. Our custom Pop-a-Top™ bottle opener keychain, as with all our aluminum products, are constructed of bright, eye-catching U.S. lab certified lead-free series-6000 anodized aluminum. They come in nine colors including silver (silver can be engraved and looks similar to frosted glass — the engraving is matt silver against the shiny silver of the opener). Item size: 2.15" x 0.35"